Hi! My name is Sr. Jerilyn Einstein, and I am a Franciscan Missionary Sister of the Infant Jesus. I was assigned to be the principal of Guardian Angels Regional School in July of 2003. It is a wonderful experience to work with the children, parents, and faculty to make our school the best! Our enrollment continues to increase as the news of our school spreads throughout Gloucester County. 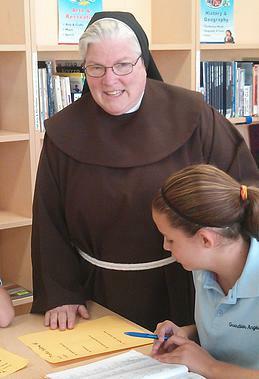 Guardian Angels Regional School follows the academic curriculum of the Diocese of Camden promoting the spiritual, moral, intellectual, cultural, social, and emotional development of each student in a value-centered environment, permeated by the spiritual climate of Barbara Micarelli, Foundress of the FMIJ Sisters. Our philosophy of education is based on her style of teaching, which has its premise, to teach all children with the love of Jesus Christ. Our educational proposal takes its inspiration from the Christian concept of the human person. That is, the vision of the human being as a child of God, “created in his image and likeness,” redeemed by Christ, called to live according to the “new man” and respond to the Father’s love. Inasmuch as the human person is “an incarnated spirit” and a “seed of eternity,” he/she is worthy of the greatest respect, concern, and deep love. As such, the human person is the basis, center and end of our educative action. Our educational environment compels us to cultivate inner dispositions of the hospitality, goodness, peace, justice, mercy, freedom, brother/sisterhood, gratitude, hope, joy, the gift of self, and love towards all creatures. It is our goal to not only cultivate these dispositions but also translate them into concrete actions of mutual love and interpersonal relationships, permeated with gospel charity.